Otter Tail County on Ice kicked off Friday, Feb. 8. Dozens of staff members stormed the ice to put on a musical festival. The event took place on frozen Otter Tail Lake. The lake was a literal frozen tundra on Friday night. Cold so extreme that heat generators malfunctioned, fingers froze, and people had to huddle into the event tent to keep warm. This is the second year of the event and cold temperatures are nothing new. Last year temperatures plummeted and OTC on Ice partied through the cold. Erik Osberg, event manager, has been frantically assembling the event despite freezing cold and a blizzard that slammed the lake just before opening day. "We had a blizzard on Thursday! We had the roads plowed, we had the site prepped, I'm feeling good, the tent is up, then a blizzard comes, we almost had to start over from scratch," said Osberg. After employing a lot of ingenuity and hardwork, new equipment was moved in. A little heat flowed and the fun began. Ice houses littered the giant lake while snowmobiles whizzed by. The event is home to a bevy of specially crafted events that best represent Otter Tail County. 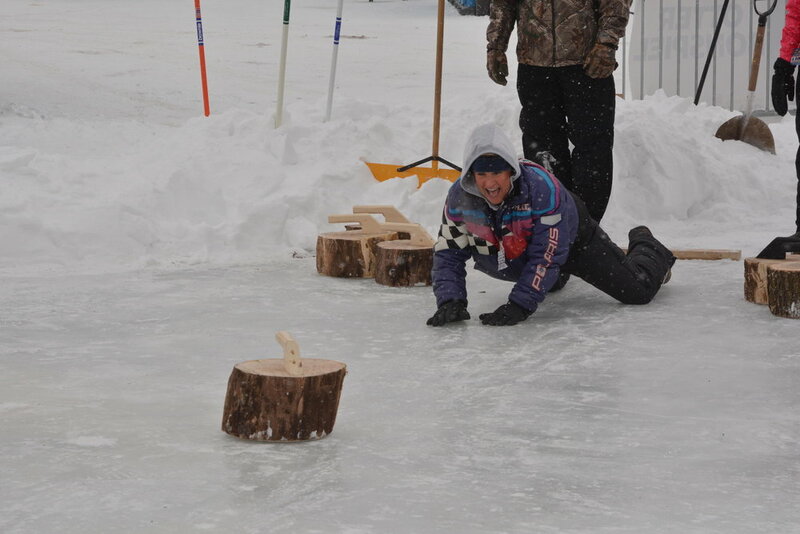 A snowmobile trail, food, shopping, live music, and even a little curling could easily keep a person busy for hours.